Blog Microsoft Azure How to Prepare for Microsoft Azure Exam AZ-200? The new role-based Azure certifications from Microsoft has come with a unique naming system. Azure exams for administrator role will have exam codes starting from 100 whereas exams for developer role will follow exam codes in 200 range. Similarly, Azure solution architect exams will be in 300 range meanwhile Azure DevOps exams will be having code name 400. Since we’ve already discussed on the preparation of Azure administrator exams, now let’s move to developer exams starting from AZ-200 exam preparation & training. AZ-200 aspirants need to have certain skills that can support their growth as Azure developers. They should be proficient in developing apps and programs using Azure tools including storage, networking, security and compute services. They also need to have at least one year experience in all development phases including design, development & deployment and testing & maintenance. Moreover, they must be proficient in at least one cloud supported programming language. 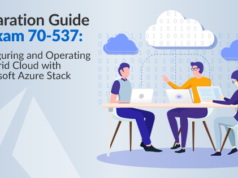 Similar to any other Azure role-based exam, you’ve to carefully follow the weight that’s given to each module in the Azure AZ-200 exam. You’ve to concentrate on 4 exam modules on your AZ-200 exam preparation. It’s described in the figure below. Around 15-20% weightage has given to this section. It’s further subdivided where you’ve to choose the appropriate storage, integrations and compute solutions for your client or organization. Design patterns, network connectivity options, hybrid typology designing also comes in this section. This is comparably a larger module where you can expect up to 35% of questions. You can see more subcategories in these modules as shown below. Each of these subsections is important due to the high overall weightage that has given to this section. This module contains approximately 15-20% questions of total exam. Its subsections include implementing secure data solutions, implementing access control and implementing authentication. It is very important to choose the right preparation material for the AZ-200 Developer Core Solutions exam. So, here we’ve gathered the effective study materials for the AZ-200 exam preparation. Go through the list before starting your preparation. 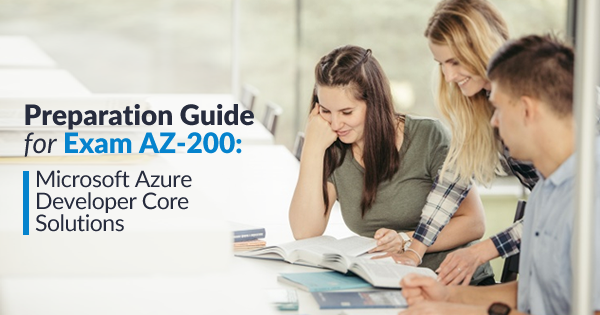 No matter what Azure course you’re opting for, whether it’s AZ-100 or AZ-200 exam preparation, Microsoft Learning page should be your primary reference material. Here, you can find the official link to schedule the exam and the pricing information corresponding to each region from where you’re taking the exam. You can find detailed information on prerequisites required for the exam on this page. There’ll be also a section for Instruction-lead training on AZ-200 exam preparation. 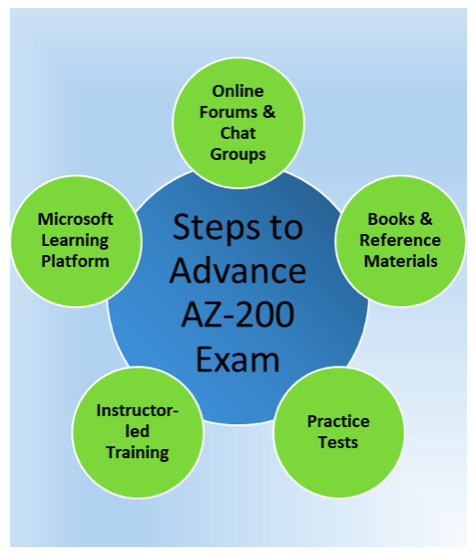 Microsoft Learning platform provides instructor-led training on AZ-200 which you can rely on a genuine AZ-200 exam study guide. Here, you can access links to instructor-led training offered by various Microsoft training partners. 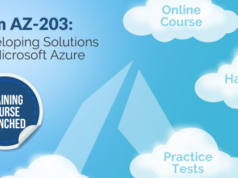 There’ll be separate training sections on different modules of Azure AZ-200 exam. You can search through Goodreads or Google Books for genuine books on Azure AZ-200 exam. However, currently, you may not find any books on the specific exam since AZ-200 is still on the beta stage. And, it’s mandatory that you keep away from websites that guarantee braindumps questions as a preparation guide for Microsoft AZ-200 exam. Anyway, you don’t have to worry about the availability of essential resources for this exam- since we are here to solve your queries regarding AZ-200 exam preparation you’ve to follow. Since AZ-200 is in beta format, Microsoft hasn’t put any practice tests on its learning portal till now. However, you can expect more such tests as the demand of the exam rises. Always, keep updated with the latest news in the learning platform so as to better information about the exam changes that can influence your AZ-200 exam preparation strategy. There can be many online discussion forums you can find for your Azure certification exam preparation. Even in the Microsoft Learning page, you can find a study group section that can solve many of your doubts. The key advantage of joining online discussion forum is that you can find many people who’re having similar doubts which you’re having. Moreover, you can find more people there who’ve already attended such an exam in the past- their experience can be useful for you for your AZ-200 exam preparation. As the AZ-200 certification exam is new, you may have some doubts or questions in your mind regarding AZ-200 exam. So, to clear your doubts, you can read these most common frequently asked questions about the AZ-200 exam. #1 Is the exam officially released and can I start my Microsoft AZ-200 Developer Core Solutions exam preparation right now? Yes. The exam is available from September 24, 2018. If you think as you’ve sufficient azure certification exam preparation knowledge of AZ-200, you can assuredly register for the exam using your Microsoft credentials. But make sure that the preparation guide for Microsoft AZ-200 exam you’re opting for, meets the necessary guidelines as we discussed already. #2 In Microsoft Learning Portal, this exam is shown as BETA. How it’ll affect my AZ-200 exam preparation and results? Actually, you don’t have to worry about anything because of this. Here, you need to wait a few months for the release of your final results. Anyway, passing on the beta exam will count towards your certification path as you don’t need to retake the exam. Every other rumor about this is totally erroneous. Not any way, it’s going to affect your AZ-200 exam preparation methods and strategies. Moreover, you’ll get around a whopping 80% discount for taking a beta exam. If you’ve tried a beta exam, you’ll get a 25% discount on the next exam. As per the Microsoft policy, beta exams are delivered on a first come-first serve basis. So, it’s important to register as soon as the beta exam link appears on the Microsoft page. #3 What is Whizlab’s take on taking a beta AZ-200 exam? If you ask us about what we recommend on the beta exam, we can only say this- just go for it. It’s because since this role based exam concept itself is relatively new, there won’t be enough AZ-200 exam preparation materials you can access. It is true- you may have to over-focus on chat forums and discussions. But if you wait for time to get more study materials, it won’t be a good option since every beta version offers 80% discount to the exam fee to the candidates. If you fail in beta, no worry- you can’t write beta again. That’s it. But if you pass, you are successfully laying one more stone towards your Azure developer certification. And, the beta test also allows you to claim a 25% discount for the next exam you are going to take. #4 How much should I pay for trying the AZ-200 exam? The pricing of this exam varies according to your geographic location. If you’re living in the United States, the total cost of this exam will be $165. This pricing is subjected to change without notice. So, it’s mandatory to verify the exact pricing from the exam provider during your AZ-200 exam preparation. There’s a discount on pricing to the members of Microsoft Imagine Academy Members, Microsoft Partner Program Members, and Microsoft Certified Trainer. If you’re a student, you’re eligible for a discount for the exam. But your academic status should be varied by Microsoft by means of valid student credentials. #5 I am certified with Microsoft Exam 70-532. Should I need to go for AZ-200 preparation then? Microsoft is retiring their 532 exams on 31, December 2018. To retain your role as an Azure developer, you must take another exam, Azure AZ-202 which is meant for the transition of Azure Developer Certification. For you, there’s no use in taking AZ-200 exam then. The focus of your Microsoft AZ-200 Developer Core Solutions exam preparation should be for solving real-time problems faced by your clients or your organization. It’s quite absurd if your intention is to get only theoretical knowledge for passing the exam. If you’ve found that any of the AZ-200 Developer Core Solutions exam study material recommends such practice, it’s good to avoid that material. A good AZ-200 exam study guide will only suggest you the best, genuine, and legitimate sources of information for your AZ-200 exam preparation. It’s your job to filter out unwanted materials from items you need. So, start your preparation for AZ-200 exam now and take the first step to become a Microsoft Certified Azure Developer Associate.